Northern Rivers, NSW, Gold Coast hinterland and Scenic Rim QLD villages, Australia. 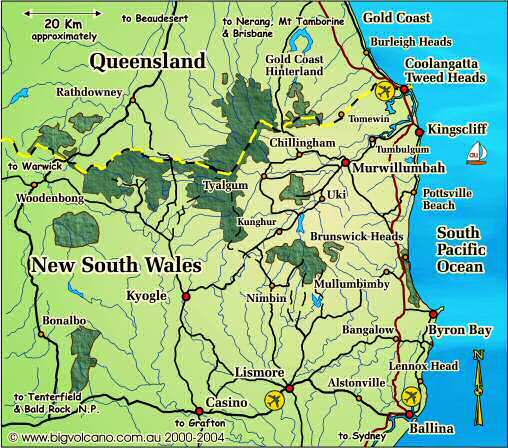 Destinations and tourist information about regional villages of the New South Wales Far North Coast and south east Queensland region. 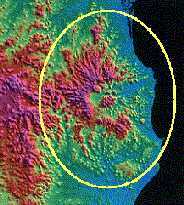 Click on the regional satellite image icon to go to an image map where you can select a locality, or alternatively browse our brief town descriptions below and select the "More info" a link to go to more detailed visitor information about the village, with links to local lodgings, tours, cruises, attractions and transport options. Many rural villages in the Northern Rivers are experiencing a revival in popularity, as young families and retirees decide to "treechange" and move from the cities to the more relaxed atmosphere that seems to epitomise "the country". 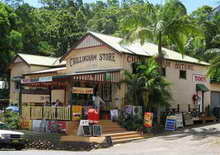 As a result of the agricultural, farming and logging pioneer past, you'll find a general store, usually with an Australia Post agency attached, and a garage or petrol station, which usually doubles as the local NRMA or RACQ (motorists association) depot, in most of the villages throughout the region. In larger hamlets and villages there's almost always a pub with a restaurant or bistro, often providing comfortable but basic accommodation. Arts and crafts outlets and roadside stalls selling local produce and products add to the ambience. Local guest houses, B&Bs, homestay and farm stay accommodation provide an ideal location for those who really want to get away from it all, especially mobile phones. They often don't work in many places here*! Beachside villages are usually more developed than their rural counterparts. As a result, a wider range of shopping and professional services are available, including sports clubs and facilities, restaurants, take away bars, mini-mart or small supermarket, banking, dentists, doctors and real estate agents who will also usually have a variety of holiday rentals and lease properties. *The National Broadband Network (NBN) may put paid to this. Bonalbo, Tabulum Accessed via Casino and Mallanganee, Tabulum and Bonalbo are in the Upper Clarence Valley, well and truly in the "back blocks" of the Wollumbin Volcano. Dairying and cattle raising, some timber milling, and farmstay, camping and wilderness lodge style of tourism are the mainstays. Chillingham Chillingham and Upper Crystal Creek are about 12 kilometres, or 15 minutes drive, along Tourist Drive 34 (Murwillumbah - Chillingham Road) from Murwillumbah, and is the NSW gateway to southeast Queensland World Heritage National Park. Gold Coast Hinterland Still referred to as the "Green behind the Gold", the Gold Coast Hinterland is the gateway to the SE QLD rainforests, ranging from Tamborine Mountain in the north to Lamington and Springbrook National Parks in the south. Kunghur, Midginbil Like most rural settlements in the region, Kunghur and Midginbil were established when timber getters harvesting the sub tropical rainforests, cleared the way for dairy and cattle farmers. Pottsville, Hastings Point, Cabarita The Tweed Coast and the seaside villages dotted along it are famous for beaches, surfing, fishing, reserves and beachside parks. Tumbulgum Originally called the "Tweed Junction", or just "The Junction", the name was changed to the aboriginal derivation of "Tumbulgum" (proun. tum-BULgim not tumble-gum) in 1880 at the behest of residents, whose petition said the name meant "meeting place of the waters". Tyalgum Tyalgum is an old cedar getting village, located virtually under the rim of the caldera due west of Mt Warning. This agricultural community produces mostly dairy and beef, but many new settlers are diversifying into alternative crops and enterprises such as coffee. Uki, Mount Warning Uki is a community based on dairying, with a base of tourist accommodation and expanding residential small acreage. The village is a heritage conservation area with heritage buildings including the Mt Warning Hotel, the old Bank Building and the old Butter Factory, now converted to art and craft galleries and artisans workspaces. Woodenbong, Urbenville If you make to Woodenbong or Urbenville, you're well and truly in the "woop woops" of the Wollumbin Volcano! This is not to say you've strayed "beyond the black stump", although you'll see a few of these around as a result of the timber getting of earlier times. Dairying and cattle raising, some timber milling, and a farm tourism presence are the mainstays.